You are here: Home / Ent. / Movie Review; Best of Enemies. (ThyBlackMan.com) There have been several films released the last two years focusing on 1950-70’s era Black-White relationships, The Green Bookwon an Oscar in 2018; that film was a reverse of the 1989 film, Driving Miss Daisy but in my opinion was a very well acted film. Now comes Best of Enemies which like The Green Book is based upon real life people, events and relationships. In this case the film is based upon a book entitled Best of Enemies; Race and Redemption In the New South written by Osha Gray Davidson, which was subsequently made into a documentary film. The Best of Enemies theatrical film was written and directed by Robin Brissell who used some of the audio and film footage from the original documentary. 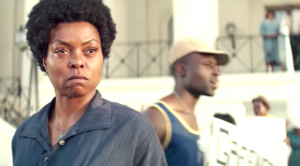 Unlike The Green Book which focuses on the interaction between a Black man and his White driver during the period of American racial segregation, Best of Enemies follows two Durham North Carolina residents as antagonists: Ann Atwater portrayed extremely well by Taraji P. Henson and C.P. Ellis played credibly by Sam Rockwell as they grapple with issues of immense social importance to both them personally, their families and the communities they come from. Atwater and Ellis are on opposite sides of the racial, ideological and social spectrum. They are familiar with each other because Atwater is a community activist/organizer and Ellis who owns a local gas station is the leader of the local United Klans of America KKK Klavern. Their paths have crossed several times over various issues in the community and there is no love lost between them. The film takes place in 1971 when much of the South was still living under racial, social and economic apartheid. The town’s Black elementary school is severely damaged by a fire. Now the segregated community faces a dilemma: what to do with the Black students and the damaged school and how to provide education for the Black students for the rest of the school year? Atwater goes to one of the city council member’s office to ask to be placed on the council agenda, she is ignored and she reacts. The chair of the council played by Bruce McGill happens to walk into the office; he intercedes and agrees to place Atwater on the meeting agenda. Later, he recruits the local KKK to also attend the meeting to insure he gets the results he wants which is to maintain the status quo while appearing to be sympathetic to Atwater. The racial animus at the council meeting heightens tensions within the Durham community. The council denies the Black parents’ request to allow Black students to attend the white school for the rest of the school year. The NAACP enters and sides with Atwater and the Black parents. The NAACP files a lawsuit on behalf of the Black parents and students. The Judge who receives the case doesn’t want to make a decision, so he asks for advice and a lawyer buddy suggests calling in a Black college professor Bill Riddick played by Babou Ceesay who is a conflict resolution specialist. His buddy calls Riddick and he agrees to help. Without giving away further details this decision brings Atwaterand Ellis into conflict. The film is not a down the line White bigot vs Black hero scenario, there are shades of gray on both sides and the film does a good job showing all sides, the pressure they are under and we the audience get to watch as the resolution plays itself out. The costumes, setting and cars are period, the characters are not stereotypical but we see the economic class, social and political dynamics of the times, some regressive and reactionary and some progressive. The only piece that struck me as not reasonable was the Black neighborhood where Atwater lived seemed too affluent but again the film is not stereotypical. See the film. The message is still relevant today, we still need black folks like Ann Atwater and Bill Reddick, to raise hell, use their talents and skills to fight the powers that be and do the right thing. I will share this, the documentary footage shown during the closing credits shows the two real life antagonists Atwater and Ellis and how they developed a respectful working relationship.